The dinghy was built as the tender to the 12 meter class yacht Flica 11, built by Fife in 1939 to a Laurent Giles design. Flica 11 was the last large yacht built by Fife. Built by Alex Robertson & Sons, Yacht Builders Ltd of Sandbank on the Clyde, Scotland in 1939. Spruce is used for the planking for lightness as she would have been hoisted up on deck. Clinker planked, 10 planks per side all fastened with copper nails and roves to Canadian rock elm steamed timbers at approx 7”centres. Oak stem, mahogany keel. Burma teak transom, sheer strakes, cappings, thwarts and sole boards. Two rowing positions on midships and forward thwarts. Midships thwart with twin grown oak knees each side, forward thwart with single grown oak knee each side. Long grown oak transom knee. Stern seat against the transom. The boat is finished in varnish throughout inside and varnished outside to the wl. incl transom. The exterior bottom to the wl is painted in dark blue gloss. Original lifting rings in the keel forward and aft. Fendered all round in white rubber D-section. Original Badges each side at the bow. One pair of 8’ varnished spruce spoon blade oars with 5 1/2” blades, leathered in way of the rowlocks. One pair of bronze rowlocks. Original Builder’s Plate and Flica 11 Name Plates. 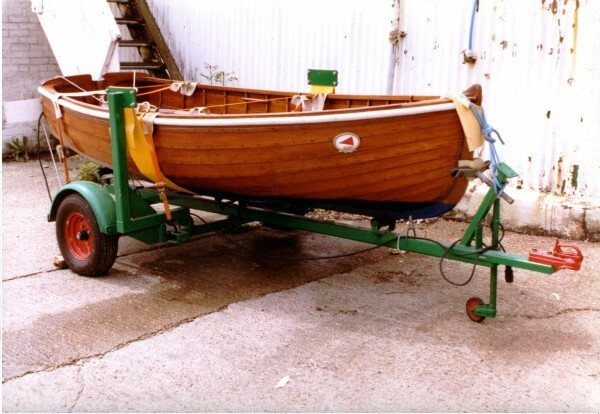 Purpose built 2-wheel road trailer with standard ball hitch, center-line keel rollers for easy launching and wide nylon midships sling to fully support the boat on the trailer.